A quaint, well presented home. Yours to enjoy and relax in comfort while exploring the wonderful attractions the district has to offer. The cottage is fully self contained comprising of two bedrooms, sleeping six. One bedroom consists of a queen bed and the other a double bed and a set of bunks. The property has a lounge, fully equipped kitchen, dining room, bathroom (no bath), laundry area and large rear veranda. The bedrooms and lounge are fully carpeted whilst the dining area has a large rug on trendy concrete squares (just fine for sandy feet!). Airconditioning is located in the lounge and rear dining area, servicing the cottage very well. Ceiling fans are also located in every room. Kids are catered for in the lounge with their own kids corner of toys. A small table and two small chairs provides the ideal place for a little drawing or colouring in with the pencils and pads located in the cupboard. In the bookcase is a selection of picture books for story time. 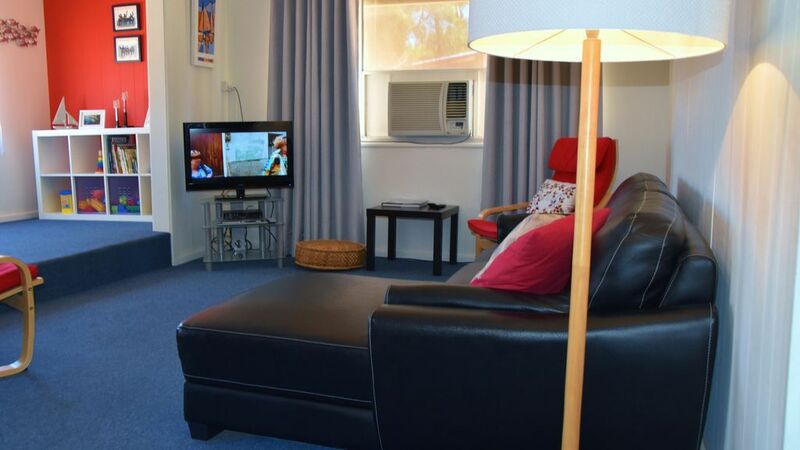 A range of movies are supplied so you can relax on the lounge or read a magazine on the couch in the dining area. You can dabble with Scrabble or try your hand at Draughts. There is ample room to park your vehicle/s and boat in the driveway. A fish cleaning sink is located outside under the shade of the shed. The property is fully fenced, great for small children. Pets are welcome however they must remain outside at all times. The yard is large and secure. There is plenty of room for them to roam, with good shade under the verandas and pepper trees. Complimentary tea,coffee, milk and sugar is supplied along with a small supply of essential consumables - washing powder, toilet paper, hand soap, tomato sauce, salt & pepper and more. A Nescafe Dolce Gusto pod machine is available for your use. Coffee capsules are limited to 4 per stay. A box of 16 capsules can be purchased at the local supermarket for approximately $10. We appreciate that families do not want to fill the car with loads of bedding and linen so we provide it all for you with the exception of beach towels. On your arrival the beds will be made. The property is centrally located, you are only a short walk to the town centre and foreshore. Streaky Bay is a fully serviced town with two supermarkets, three fuel outlets, restaurant, pub, chemist, hairdressers, newsagency, hospital, dentist, bakery, florist, surf shop, butcher shop, hardware store, local oysters and more. Short walk to the town centre. Short stroll to the jetty and foreshore surrounds. Front loader with washing powder. Plenty of off street parking suitable for boats, caravans and vehicles. Large fridge. Additional 150L chest freezer on site. Nescafe Dolce coffee maker. Coffee pods provided are limited to 5. Available for purchase at the local supermarket. Small quantity of consumables available, ie washing powder, salt & pepper, tomato sauce, coffee, tea, sugar, milk, alfoil, cling wrap. Cable for phone connections provided. Various children's books and magazines available. Scrabble, Draughts, Trouble and jigsaw puzzles. Kids sand buckets and 2 boggy boards on site. Pet friendly, fully fenced yard with loads of room and good shelter. Pets are not permitted in the property. Great location close to the Main Street and the beach. Lots of space outside for the dogs . An exquisite well equipped traditional cottage. Located in a quiet location, but convenient for shops, pub and jetty. The complimentary home produced oranges, lemons and eggs were much appreciated. We really enjoyed our week there and can thoroughly recommend a stay here. would highly recommend the cottage very clean maintained well. hope to stay longer next visit. The owner was a pleasure to deal with. House would be perfect for family. We were very happy there. Hi Helen, it was a pleasure having you both stay. Your communication was very much appreciated and your attention to tidiness on departure was outstanding. Thank you. Lovely welcoming property. Well maintained with all your holiday needs catered for. Very clean with modern bathroom and a great comfy bed. Great location, walk to town. Would definitely stay again. Thank you Corinna. We strive to provide a welcoming, clean and self sufficient holiday home. We look forward to your return. Best wishes. A very pleasant place to stay. Very comfortable and a convenient location. Recommended. Streaky Bay is a picturesque town located on the west coast of the Eyre Peninsula. The spectacular coastline offers not only great coastal sight seeing but also fabulous swimming, fishing, surfing and more. Scenic drives can be taken to Point Labatt, Murphy's Haystacks, Smooth Pools and Whistling Rocks to name a few. The National Trust Museum and the Powerhouse Museum housing over 400 engines are both located in the township of Streaky Bay. Smaller museums are located within the district at Haslam and Poochera. Consider taking a short 3km drive south of Streaky Bay to visit 'Eyre's Waterhole', the waterhole hole used by explorer Mr John Eyre in 1840. At Baird Bay you have the opportunity to join a eco tour and swim with the sea lions and dolphins. Back in town you can enjoy the offerings of the local eateries and shops.